(Jacques Helft and Co., New York), by 1943; sold to Ailsa Mellon Bruce [1901-1969], New York; gift 1970 to NGA. Lent by Helft and Co. to 1943 exhibition in New York. Paris: A Loan Exhibition, Coordinating Council of French Relief Societies, New York, 9 December 1943- 9 January 1944, no. 31, repro. Extended loan for use by Secretary George P. Shultz, U.S. Department of State, Washington, D.C., 1985-1989. European Paintings: An Illustrated Summary Catalogue. National Gallery of Art, Washington, 1975: 28, repro., as Paris Street Scene. European Paintings: An Illustrated Catalogue. National Gallery of Art, Washington, 1985: 47, repro. Offenstadt, Patrick. 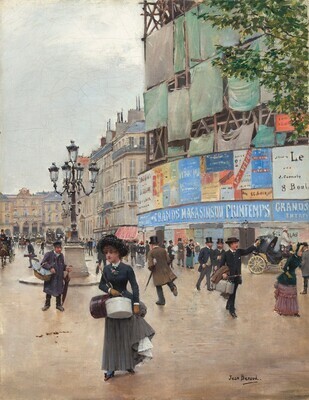 Jean Béraud 1849-1935. The Belle Epoque: A Dream of Times Gone By. Catalogue Raisonné. Cologne, 1999: no. 18, repro.